The threat of a human-caused apocalypse remains at ‘two-minutes to midnight,’ according to the Bulletin of Atomic Scientists. 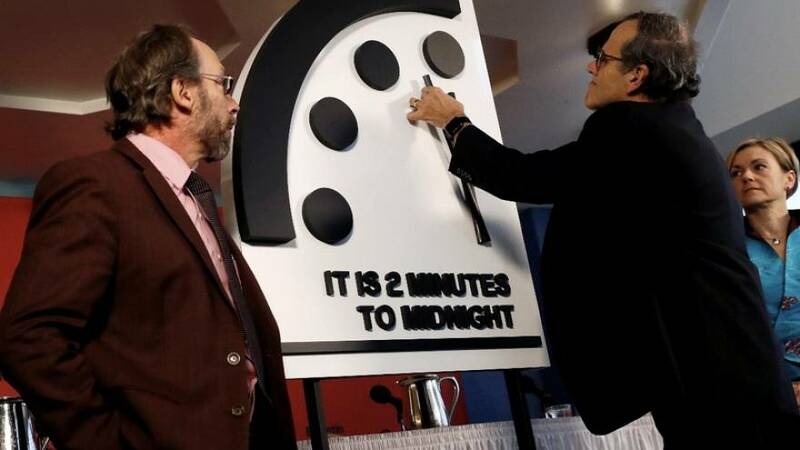 The US-based team of scientists — including a board of 15 Nobel Laureates — say they have kept their annually-updated metaphoric clock at two minutes from potential Armageddon because of two threats: nuclear weapons and climate change. This status remains unchanged from last year when the Bulletin moved the likelihood of the end of the world up a half a minute — from 2.5 minutes to two minutes. The clock now remains at the closest it has ever been to the apocalypse since scientists began recording the Doomsday Clock more than 70 years ago. “These major threats — nuclear weapons and climate change — were exacerbated this past year by the increased use of information warfare to undermine democracy around the world, amplifying risk from these and other threats and putting the future of civilization in extraordinary danger,” the Bulletin's president and CEO, Rachel Bronson, said in a statement. Bronson cited specific examples, such as the US withdrawal from both the Paris Climate Agreement and the Iran Nuclear Deal, as reasons for the Doomsday Clock's status. Is the future of civilisation safer or at greater risk than last year? Is the future of civilisation safer or at greater risk today, than the more than seven decades prior in which scientists have been asking these questions? The Doomsday Clock has been steadily falling towards zero since 1991, when it was moved to ‘17 minutes to midnight’ because the Bulletin felt the world had "entered a new era." This coincided with crucial democratic victories such as the fall of the Berlin Wall and the end of the Cold War. According to scientists, nearly 30 years later, humanity is inching closer to the self-inflicted end of their existence.